"Thanks again for everything guys! We are thrilled to have our basement back!" "The installation crew was very professional and friendly. The salesman was very knowledgable. The crew cleaned up well. We would most definately refer your..."
North American Basement Systems has been helping homeowners just like you solve their wet basement problems ever since we opened our doors in 1987. Our fully trained and certified technicians know the signs and symptoms to look out for when recommending the best basement waterproofing solution. As a part of the Basement Systems dealer network, we only work with proven, patented products that undergo continual testing and improvement. From high-volume sump pumps to complete drainage systems and energy-efficient dehumidifiers, we have total faith in the lineup of products and services we have to offer. If you have musty smells, walls that feel damp, or if your basement floods with heavy rain, we can help. No matter how big or small your basement water problem might seem, acting sooner rather than later will always save you time and money in the long run – and your home will be safer for it. We offer free estimates in Regina, Brandon, Yorkton and areas nearby – schedule yours today! North American Basement Systems fixes leaky basements in Saskatchewan and Manitoba, in areas like Dauphin, Weyburn, Estevan, Virden, White City, Moosomin, Melville and neighboring towns and cities. 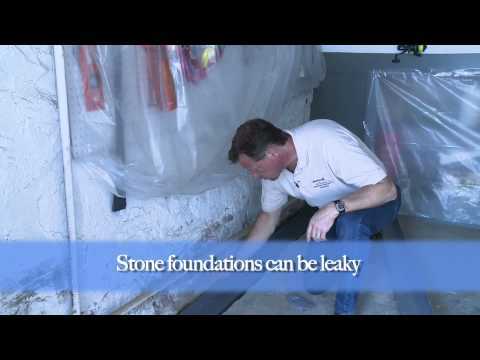 Contact us today for a free wet basement repair estimate. Heavy equipment is brought in to dig out the entire perimeter of the basement. New drain lines are installed, and sometimes a waterproof coating is applied to foundation walls. This waterproofing strategy is expensive and often damages lawn and garden areas. Exterior drains are prone to clogging with silt and roots over time. This drain line is installed underneath the basement floor, just inside the foundation walls. The hidden drainage system brings water to a sump pit, where a sump pump automatically pumps it outside. Also known as a French Drain, this system is not prone to clogging; it’s reliable and easy to service. A hollow plastic baseboard is installed along the base of basement walls to form a drainage channel that directs water to a sump pump system. A baseboard-type drainage system is sometimes recommended when the basement slab is too thin to accommodate a French Drain. This waterproofing technique involves "painting" basement walls and floors with a waterproof, cement-based coating that's supposed to seal out moisture. Even when applied correctly, this thin membrane usually fails in response to prolonged hydrostatic pressure from outside the foundation.